Send your Dad a sumptuous Father's Day feast on his very special day! 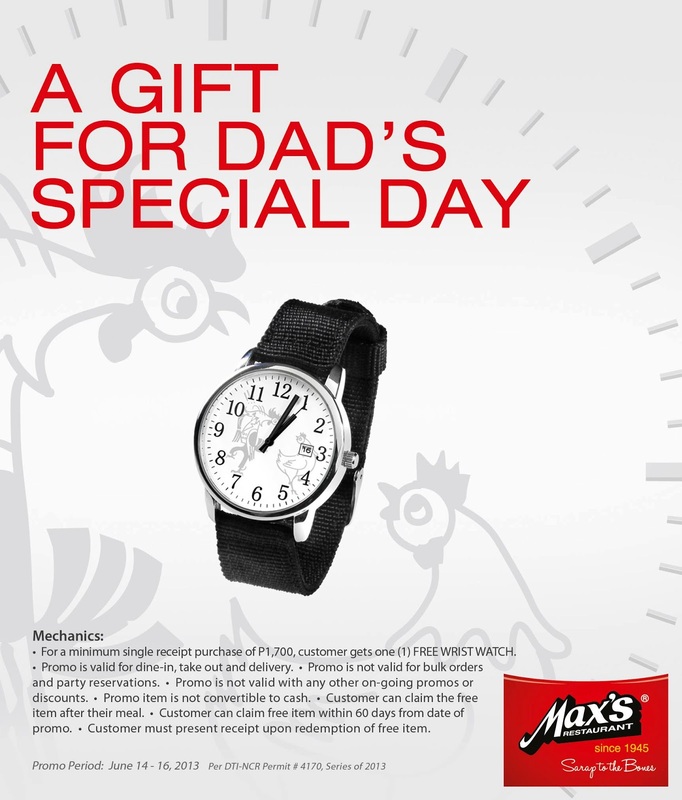 Send Max’s food to your Papa and your loved ones anytime anywhere within the Philippines* by placing an order online at www.maxschicken.com this coming Father's Day (June 16, 2013 Sunday)! As an added surprise, Max's will include an exclusively-designed Max's WRIST WATCH for FREE for a minimum order worth P1,700! This promo is available for all orders scheduled for processing (delivery/takeout/dine-in transactions) only on June 14, 15 and 16, 2013 (Philippine local date and time) so better place your advance orders online now! Make sure to set the delivery schedule on the specific dates (June 14, 15 & 16, 2013 only) to avail of the FREE Max’s wrist watch! This is also available in all Max's stores nationwide (within the Philippines) for dine-in, takeout and delivery. As long as you are online wherever you are in the world then you can order and pay online to send Max's to your family and friends anywhere within the Philippines* by ordering at www.maxschicken.com!